If you are looking for a rental car in Calgary, VroomVroomVroom can help you find the best deals from trusted agencies such as Avis, Enterprise, Budget, Alamo, Thrifty and Hertz. Simply fill in the search box above to compare the best car rental rates and book the right vehicle for you. Calgary is an exciting and vibrant town in Alberta with a rich history of cattle ranching, farming and oil production. The city is one of the most historic and interesting cities in the country with traditional architecture and a host of festivals celebrating the region's past. Calgary currently has a population of more than 1.2 million. Why rent a car in Calgary with VroomVroomVroom? 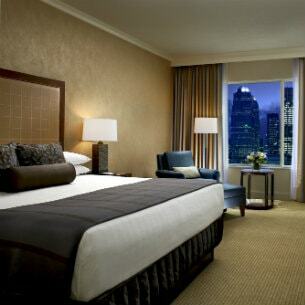 Great rates: Save time and money by booking with us in advance. In addition, read about our Price Promise to find out how you can get the best deal. Convenience: With your rental car, you will have the freedom to travel all over Calgary and Southern Alberta without missing any of the top sites. Drive a car rental in Calgary and avoid relying on public transport. Book a car rental and ensure that you do not need to rely on public transportation. Flexibility: Your holiday or business trip will be made easy with an affordable hire car. See top Calgary sites at your own pace, such as the rugged Canadian Rockies, Calgary Tower, Calgary Zoo, Chinatown or take in a Calgary Flames NHL game. Your rental car will give you extra storage space and additional comfort. Wide selection of vehicles: We can also help you compare rental cars from Calgary International Airport(YYC) to help make your holiday easier. Aside from rental cars, VoomVroomVroom can also help you find and compare reliable RV rentals in Calgary. Trusted since 2001: We are experts in rental cars. Our highly-motivated customer care experts are willing to assist you. Just contact us via phone, email or live chat. You can also leave us a message on Facebook and Twitter. If you are looking for the perfect weather, the ideal time to visit Calgary is during late May to September. Skiing conditions are at their best during November to March. Generally, the winter months in Calgary mark the low season, with freezing local temperatures. Expect accommodation prices to be higher during summer, and it is a good idea to book your hotel early. April and October are good months to visit when there are not as many other tourists and the temperature is milder. Most of the city's major events occur during the summer months. The Calgary Stampede takes place in July, featuring an exciting annual rodeo. If you are in Calgary in September, be sure to participate in the Chinatown Street Festival, which features a range of delicious food and exciting performances. From downtown Calgary, it is only an hour's drive west in your rental car to the Rocky Mountains. Travel time to Edmonton is only about three hours. If you are planning to explore Alberta with a car rental in Calgary, it is a good idea to check the traffic and road situations before you depart to avoid any delays. For more rules and restrictions while you're driving your rental car in Canada, read here. Are you thinking about your next holiday in Calgary? There's a lot of land to explore, both in the city and around the countryside, so it's wise to book a car rental in Calgary so you can explore the whole area. And here are just a few of the best of them. 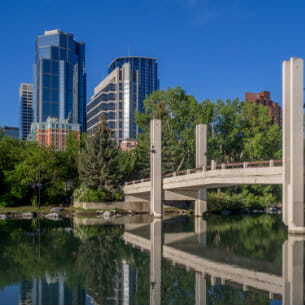 The beautiful urban park is situated on the Bow River just north of downtown Calgary. The 20 hectares of land that the park has were a donation of the Prince family, the family of the man that built Eau Claire Lumber Mill, Peter Anthony Prince. The park is very appreciated by the locals of Calgary and by tourists as well. Great festivals such as Canada Day and Calgary Folk Festival are held in this park all throughout the year. Apart from the urban greenway Prince's Island Park, visitors have easy access to other downtown attractions in their car rental. Telus Spark is a science museum that you should visit while in Calgary. The interactive exhibitions and the educative presentations make this attraction suitable for all the family. Each year, this museum attracts more than 300,000 visitors. Originally called the Husky Tower, this is a must-see on any visitor's itinerary. The 190.8-meter free standing observation tower can be found in Downtown Calgary. This is the perfect place to enjoy great views of the city. This is the largest shopping center in Calgary, with more than 250 stores. It opened in 1960 and has almost 1,500,000 square feet. The mall has a large food court than can accommodate about 900 people and offers more than 20 different food vendors with dishes from the international cuisines. The lovely park located in downtown Calgary. It is situated on the Macleod Trail. In 1988, it was used as a venue for the medal ceremonies of the Winter Olympic Games held in Calgary. Canada Olympic Park is a destination for those who want to enjoy skiing (downhill or cross-country), ski jumping, snowboarding and luge. It serves as a primary training venue for competitive athletes like Olympic team hopefuls! Canada Olympic Park is also a mountain biking trail during Summer. If you rent an SUV with a bike rack, it's quite easy in Calgary to go mountain biking here, or out west in the foothills of the Canadian Rockies. Hyatt Regency Calgary is adjacent to the Calgary TELUS Convention Centre and situated on the historic Stephen Avenue Walk, a year round lively pedestrian mall. As one of the city's premium luxury hotels, Hyatt Regency Calgary affords the perfect setting for both business and leisure experiences. Host to the largest hotel ballroom in the city, offering a further 22 dynamic event spaces totaling over 33,000 sq.ft., Hyatt accommodates meetings and events of all sizes connecting our guests to endless possibilities. Other amenities include the award-winning full-service Stillwater Spa, Thomsons Restaurant and locals favourite Sandstone Lounge. Drive your Calgary car rental to La Brezza Ristorante, which is the top-reviewed restaurant in the city. For fine Italian cuisine, La Brezza is your best choice in the entire Calgary metropolitan area! If you're in the mood for seafood, why not hop into your rental car and head over to 7 Seas Seafood & Grill? This place is another of the hottest eateries in this cool city, and features wonderful food and great service! The menu is an interesting combination of Canadian and Filipino dishes, and they have the best wait staff you'll find anywhere! Hope to see you there! Alamo Calgary 10th Ave Sw - 120 10 Ave Sw , Calgary, AB. Avis Avis 9th Avenue - 115 9th Avenue Southeast, Unit 162, Calgary, AB. Avis North Hill Centre - 1616 14th Avenue Northwest, Calgary, AB. Budget Calgary - 724 6th Avenue Southwest, Calgary, AB. Budget Calgary - 140 6th Avenue Southeast, Calgary, AB. Budget Calgary - 1544 16th Avenue Northwest, Calgary, AB. Budget Calgary - 5210 Macleod Trail Southwest, Calgary, AB. Enterprise Calgary Downtown - 1036 - 9 Avenue Sw , Calgary, AB. Enterprise Calgary South Central - 4115 Macleod Trail South , Calgary, AB. Dollar CALGARY - 5TH AVENUE, AB, CA DLE - 114 5TH AVENUE SOUTHEAST, CALGARY, AB.